Cooking with spices can be tricky and to those new to using spices complicated! This may not be the case if you know how and when to use them. You go on a buying spree after reading a yummy easy curry recipe and buy those 100 gms packs and bottles of spices for making that one dish!! After the initial few attempts of using those spices, they land in the back of your kitchen cabinets losing their flavour and freshness!! The reason for the spices to take a back seat is because you used them to follow a recipe step by step but are now unsure how to reuse them to make other dishes and not just Indian food. The way you season food will have a direct impact on the flavour and taste of a dish. Learning the art to season your food not only makes cooking fun but also easy!! In this post, we will look at the how-to of cooking with spices. A popular reason for most attendees who attend my cooking classes is not just to learn ‘A’ dish. It is more a need to know, when and how to add spices during the cooking process for the dish to taste authentic. This indeed is very important. The use of spices is what makes Indian cooking different and perhaps a bit complex than any other cuisine. Saying that cooking with spices is not just limited to Indian cuisine. They can be used with any dish you fancy spicing UPP! In fact, every cuisine in the world have native spice mixes and blends. Using spices for cooking food has become increasingly popular because of their flavour and health enhancing properties. But randomly adding spices without an awareness of their effect on the dish, may lead to a flavour mishap. This may well discourage you from experimenting with spices because you don’t want to waste that beautiful cut of lamb you bought from the fresh market. It’s always a good idea to learn and understand how to work with spices in its best form for their maximum impact on the dish. This stepwise guide will take you through a journey of a spice life cycle when cooking with them to elevate the flavours. There are seemingly hundreds of spices all over the world. Few are integral to Indian cuisine such as cumin powder, coriander powder, garam masala powder, chilli powder, turmeric powder and few others. The way to know your spices is to work with them. You need to understand that each spice plays a certain role in the dish. Use your sense of intuition when it comes to selecting and adding spice to the dish. You can do so by smelling or perhaps even tasting just a tiny speck of the spice you wish to use. One key point to remember is that not all spices render taste. Different spices serve different purposes. Few add flavour and aroma, some spices are used to add taste while there are others used for adding colour. It is mostly the powdered spices which enhance the taste of the dish, while whole spices are used to impart flavour and aroma. For example, a spicy vindaloo or rogan josh will require more spices to make it hot and spicy and hence use more quantity of powdered spices. While a mild korma or creamy gravy will require whole spices, since korma dishes are mild and aromatic. When it comes to cooking with spices, it is best to first identify whether the dish requires enhancing taste, flavour or both and select your spices accordingly. This will give you an idea of how much or how little or the kind of spice you need to make the dish. Here is a list of 28 Indian cooking spices with information on how to use them and their impact on food to get you going. Once you are able to differentiate between whole and ground spices and their impact on food, it is time to start cooking. We know that carrots taste different when eaten raw, cooked, boiled or baked. This goes the same for spices. A unique quality of spices is the way the essence of a particular spice changes when it is processed further. What I mean by this, is that same spice can taste different and give a completely different kind of taste or flavour to the dish depending on how it has been processed during cooking. Let’s take cumin seeds as an example ingredient for a Lamb Bhuna recipe. Cumin seeds when used whole imparts a very woody aromatic flavour but does little to its taste. The same spice in a powder form provides a pungent spicy taste to the dish. If the seeds are roasted and ground then the flavour and the taste both get further enhanced and give a woody, fresh and a sharp spicy taste to the dish. In this Lamb Bhuna dish we have used whole spices and then used them again as a roasted ground spice. This changes the form of spices during the cooking process. That is the form changes from being a raw whole spice to roasted ground spice emitting stronger flavour compounds. How it’s going to be processed further while cooking i.e. tempered, sautéed, simmered. Planning the type and form of spice and anticipating the change in taste will have a direct effect on the dish’s palatableness. Apart from being of a particular form that is ground or whole, spices also have distinctive taste classification such as sweet, sharp, pungent or simply a colour enhancer. This takes us back to step one that is while getting to know your spice, do at the same time familiarise yourself with the taste classification of the spice. This will help in simplifying the underlying taste that you wish to bring in the dish. sweet spices such as nutmeg, cinnamon, cloves, cardamom will give a subtle sweetness to the dish and impart flavour. sharp or hot spices such as chilli powder, pepper, garam masala will render heat. pungent spices such as coriander powder, cumin powder, asafoetida are primarily the taste enhancers giving the dish a distinctive taste. When using spices, it’s always a good idea to bear in mind the combination of taste with other ingredients in the dish. This will help you to get a balance of taste and flavour. A common belief is that Indian food is spicy. Does that then mean that you add as many or as much spices to your dish just for it to be called ‘spicy’? The answer is a loud NO!! Spices, especially those that render heat such as chilli powder, pepper, is an individual preference. If one person enjoys the hot kick that does not mean that others like their ears and mouth to be put on fire! Also, spicing a dish with every other spice from your cupboard DOES NOT mean you are making a spicy curry. There has to be a method and need for it. As I mentioned in previous steps, first get yourself familiar with the spice, its form and work on the combination of mixing spices with other ingredients. The best way to do this is to follow recipes which call for simple and minimum spices. Start with small amounts like ½ to 1 tsp of spice and slowly work your way. Over spicing simply kills the taste of other ingredients and does more harm than good. I hope by this step you have a better understanding of why spices are used in food and how it impacts the flavour depending on the type and amount of spices you add. The best way to get comfortable working with them is to turn your kitchen into a spice lab! If you start small but often, you will get more confident using and cooking with spices. Do not limit yourself to making Indian dishes alone. You can spice up your steaks, stews and soups too! The advantages of doing this are that spices give an instant lift to any dish and also have health benefits. As you get more comfortable with using spices in combination with others, you can eventually start making your own spice blends and storing them for easy access. There is no limit to the various kinds of combinations you can make with spices varying the ingredients and quantities. All you need to do now is to follow the 5 steps explained above and start with an easy recipe that requires miminum spices. This infographic of a list of 14 everyday spices for beginners will help you to identify the spices, their primary taste, the impact it has on the dish and the best food combinations using the spices. You can make this Easy Pumpkin and Beans Curry with Coconut Milk . This dish is made with the basic Indian spices both in whole and ground form and is a good starting point. Now put on your scientist coat aka apron and get experimenting and enjoy Spicing it UPP !! What has been your experience so far with adding spices to your food? 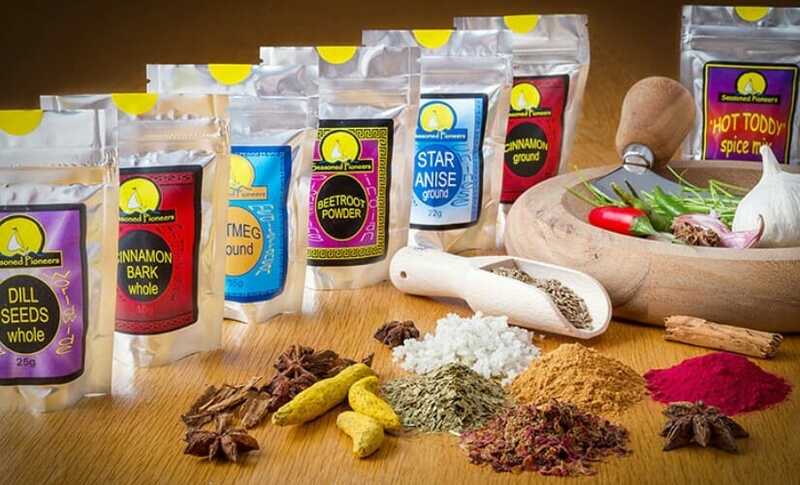 Do you have any favourite spices that you feel most comfortable using? I agree I think Indian cuisine has the most complex type of ingredients especially when it comes to spices. The taste and flavors are very rich and learning to blend each is difficult but with expertise and skills its possible. I’ve always been so scared to use spices incase it ruins the food so I’m excited to use some of your tips! I loveee Indian food so would love to make my own 🙂 thanks for sharing! Start using small amounts of different spices, and built your way into it. It gets easy that way! This is a really helpful guide for anyone. I love learning new information about spices that I may use. i love spices, i can’t understand people not using spices, food has no taste at all! They sure are little Jems of flavour that brings out the taste! Glad you like them too!